, a late dramatic and miscellaneous writer, was the great grandson of the preceding. His father, Denison, so named from his mother, was educated at Westminster school, and from that admitted fellow-commoner of Trinity college, Cambridge. He married, at the age of twenty-two, Joanna, the younger daughter of Dr. Richard Bentley (the Phoebe of Byron’s Pastoral); by whom he had a daughter, Joanna, and Richard, the subject of this article. Though in possession of an independent fortune, he was readily prevailed upon by his father-in-law to take the rectory of Stanwick, in. Northamptonshire, given to him by lord chancellor King, as soon as he was of age to hold it. From this period he fixed his constant residence in that retired spot, and sedulously devoted himself to the duties of his function, never holding any other preferment for thirty years, except a small prebend in the church of Lincoln, given him by his uncle bishop Reynolds, He was in the commission of the peace, and a very active magistrate in the reconcilement of parties rather than in the conviction of persons. When the rebels were on the march, and had advanced to Derby, he raised among the neighbouring parishes two companies of 100 men each for the regiment then enrolling under the command of the earl of Halifax, and marched | them in person to Northampton. The earl, as a mark of his consideration, insisted upon bestowing one of the companies upon his son, who being too young to take the command, an officer was named to act in his place. Some time after, on the approach of the general election for the county of Northampton, a contest took place with the rival parties of Knightly and Hanbury, or, in other words, between the tories and the whigs. His politics accorded with the latter, and he gave a very active and effectual support to his party. His exertions, though unsuccessful, were not overlooked by the earl of Halifax, who was then high in office, and lord lieutenant of the county. Offers were pressed upon him; yet, though he was resolute in declining all personal favours, he was persuaded to lend an ear to flattering situations pointed out for his son, who was shortly afterwards employed by lord Halifax as his confidential secretary. In 1757 he exchanged the living of Stanwick for Fulham, in order to be nearer his son, whose attendance on the earl of Halifax required his residence in town. On the earl being appointed lord-lieutenant of Ireland, he was made one of his chaplains; and in 1763, at the close of his lordship’s administration, was promoted to the bishopric of Clonfert. In this situation he much ingratiated himself with all classes of people by his benevolence and generosity. He introduced many improvements and comforts among the Irish peasantry. He encouraged the English mode of agriculture by judicious rewards; and, as one of the members of the linen trade, introduced a number of spinning-wheels, and much good linen was made in consequence. This improving manufacture formed an interesting occupation also to his lady, and flourished under her care. 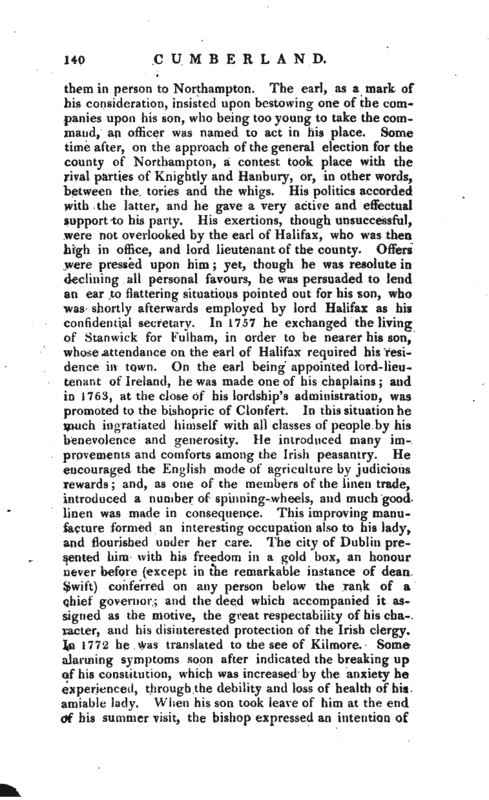 The city of Dublin presented him with his freedom in a gold box, an honour never before (except in the remarkable instance of dean Swift) conferred on any person below the rank of a chief governor; and the deed which accompanied it assigned as the motive, the great respectability of his character, and his disinterested protection of the Irish clergy. In 1772 he was translated to the see of Kilmore. Some alarming symptoms soon after indicated the breaking up of his constitution, which was increased by the anxiety he experienced, through the debility and loss of health of his, amiable lady. When his son took leave of him at the end of his summer visit, the bishop expressed an intention of | attempting a journey to England; but died in the winter of the same year; and this sad event was speedily succeeded by the death of his lady, whose weak and exhausted frame sunk under the blow, May 27, 1775. 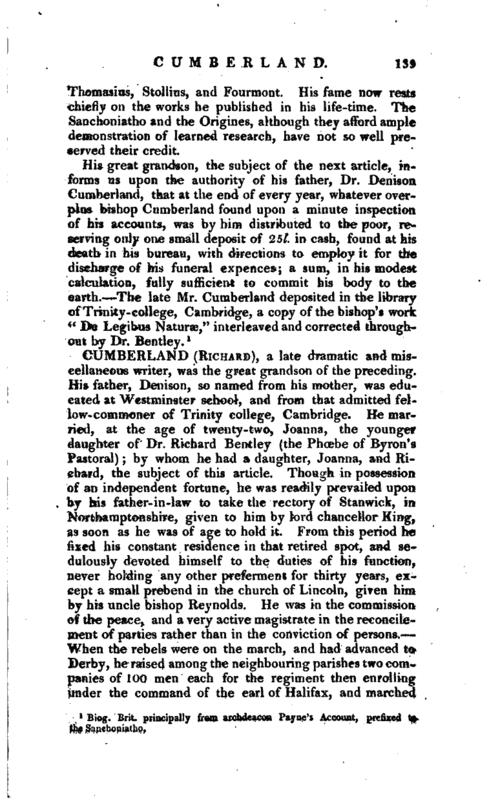 Richard, the subject of this article, was born Feb. 19, 1732, under the roof of his grandfather Bentley, in the master’s lodge in Trinity college. When turned of six years of age, he was sent to the school at Bury St. Edmund’s, then under the mastership of the reverend Arthur Kinsman. For some time he made but little progress in his learning; till Kinsman, having observed his low station in the school, publicly reproved him; and thus roused in him a spirit of emulation. While he continued in this school, his grandfather Bentley died; and the affectionate manner in which Kinsman imparted the melancholy event to him, with the kind regard he evinced for his improvement, wrought so much upon his mind, that his task became his delight. In his exercises, however, he describes himself, in his “Memoirs,” as aiming at something like fancy and invention, and as being too frequently betrayed into grammatical errors, which did him no credit with his master, who commented on his blunders in one instance with great severity, producing so great an effect on his sensibility, that he never perfectly recovered it. 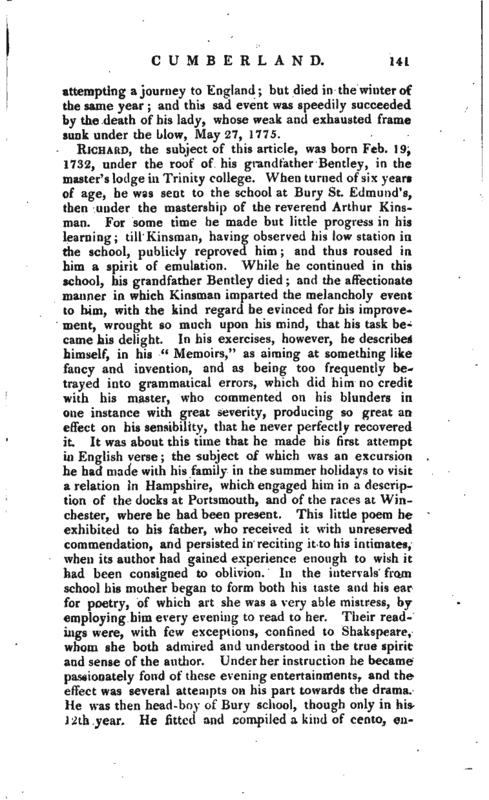 It was about this time that he made his first attempt in English verse; the subject of which was an excursion he had made with his family in the summer holidays to visit a relation in Hampshire, which engaged him in a description of the docks at Portsmouth, and of the races at Winchester, where he had been present. This little poem he exhibited to his father, who received it with unreserved commendation, and persisted in reciting it to his intimates, when its author had gained experience enough to wish it had been consigned to oblivion. In the intervals from, school his mother began to form both his taste and his ear for poetry, of which art she was a very able mistress, by employing him every evening to read to her. Their readings were, with few exceptions, confined to Shakspeare, whom she both admired and understood in the true spirit and sense of the author. Under her instruction he became passionately fond of these evening entertainments, and the effect was several attempts on his part towards the drama. He was then head-boy of Bury school, though only in his 12th year. He fitted and compiled a kind of cento, | eiititled “Shakspeare in the Shades,” in one act, in which the characters of Hamlet and Ophelia, Romeo and Juliet, Lear and Cordelia, were introduced, and Ariel as an attendant spirit on Shakspeare, who is present through the piece: some extracts from this juvenile production are printed in his “Memoirs.” Mr. Kinsman intimating his purpose of retiring from Bury school, young Cumberland was transplanted to Westminster, and admitted under Dr. Nichols, where he remained about a year and a half; and particularly profited there in point of composition. 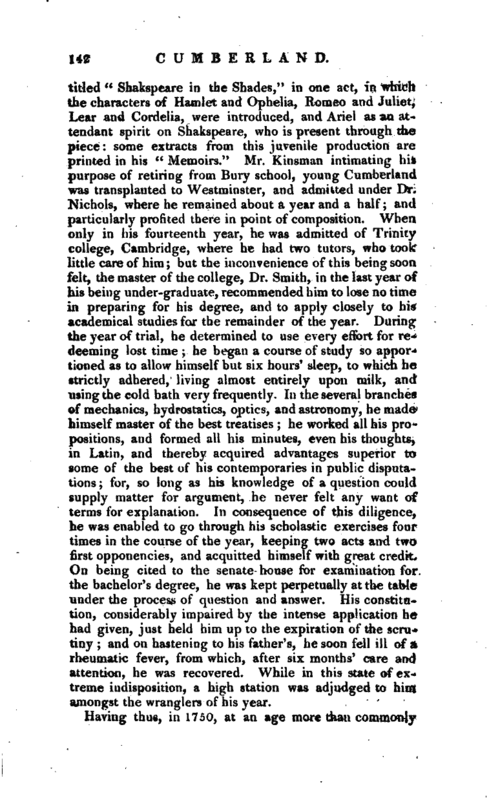 When only in his fourteenth year, he was admitted of Trinity college, Cambridge, where he had two tutors, who took little care of him; but the inconvenience of this being soon felt, the master of the college, Dr. Smith, in the last year of his being under-graduate, recommended him to lose no time in preparing for his degree, and to apply closely to his academical studies for the remainder of the year. During the year of trial, he determined to use every effort for redeeming lost time; he began a course of study so apportioned as to allow himself but six hours’ sleep, to which he strictly adhered, living almost entirely upon milk, and using the cold bath very frequently. In the several branches of mechanics, hydrostatics, optics, and astronomy, he made himself master of the best treatises; he worked all his propositions, and formed all his minutes, even his thoughts, in Latin, and thereby acquired advantages superior to some of the best of his contemporaries in public disputations; for, so long as his knowledge of a question could supply matter for argument, he never felt any want of terms for explanation. In consequence of this diligence, he was enabled to go through his scholastic exercises four times in the course of the year, keeping two acts and two first opponencies, and acquitted himself with great credit. 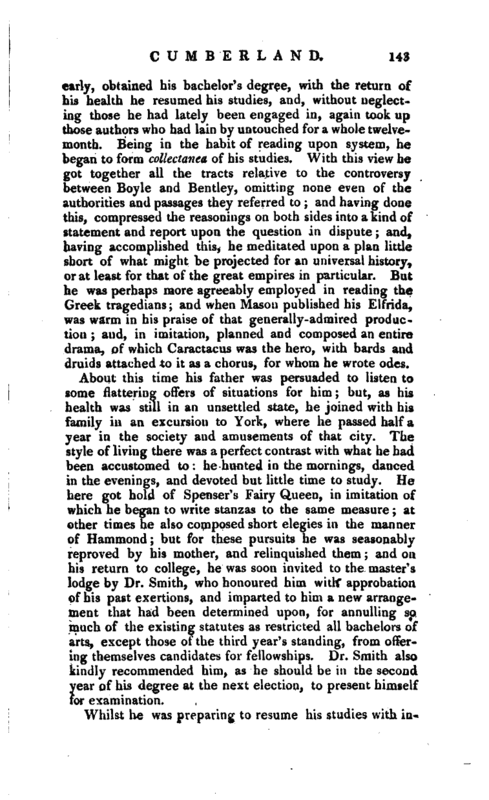 On being cited to the senate -house for examination for the bachelor’s degree, he was kept perpetually at the table under the process of question and answer. His constitution, considerablv impaired by the intense application he had given, just held him up to the expiration of the scrutiny; and on hastening to his father’s, he soon fell ill of a rheumatic fever, from which, after six months’ care and attention, he was recovered. While in this state of extreme indisposition, a high station was adjudged to him amongst the wranglers of his year. Having thus, in 1750, at an age more than commonly | early, obtained his bachelor’s degree, with the return of his health he resumed his studies, and, without neglecting those he had lately been engaged in, again took up those authors who had lain by untouched for a whole twelvemonth. Being in the habit of reading upon system, he began to form collectanea of his studies. With this view he got together all the tracts relative to the controversy between Boyle and Bentley, omitting none even of the authorities and passages they referred to; and having done this, compressed the reasonings on both sides into a kind of statement and report upon the question in dispute; and, having accomplished this, he meditated upon a plan little short of what might be projected for an universal history, or at least for that of the great empires in particular. But he was perhaps more agreeably employed in reading the Greek tragedians; and when Mason published his Eu‘rida, was warm in his praise of that generally-admired production; and, in imitation, planned and composed an entire drama, of which Caractacus was the hero, with bards and druids attached to it as a chorus, for whom he wrote odes. About this time his father was persuaded to listen to some flattering offers of situations for him; but, as his health was still in an unsettled state, he joined with his family in an excursion to York, where he passed half a year in the society and amusements of that city. The style of living there was a perfect contrast with what he had been accustomed to: he hunted in the mornings, danced in the evenings, and devoted but little time to study. He here got hold of Spenser’s Fairy Queen, in imitation of which he began to write stanzas to the same measure; at other times he also composed short elegies in the manner of Hammond; but for these pursuits he was seasonablyreproved by his mother, and relinquished them; and on his return to college, he was soon invited to the master’s lodge by Dr. Smith, who honoured him with approbation of his past exertions, and imparted to him a new arrangement that had been determined upon, for annulling so much of the existing statutes as restricted all bachelors of arts, except those of the third year’s standing, from offering themselves candidates for fellowships. Dr. Smith also kindly recommended him, as he should be in the second year of his degree at the next election, to present himself for examination. Whilst he was preparing to resume his studies with | increased attention, he received a summons from lord Halifax to assume the situation of his private confidential secretary. He accordingly came to town; but, among the new connexions in which he was consequently thrown, he met with nothing that in any degree interested him, and at the recess he accompanied lord Halifax to Horton, and from thence went to Cambridge. There were six vacancies, and six candidates of the year above him. 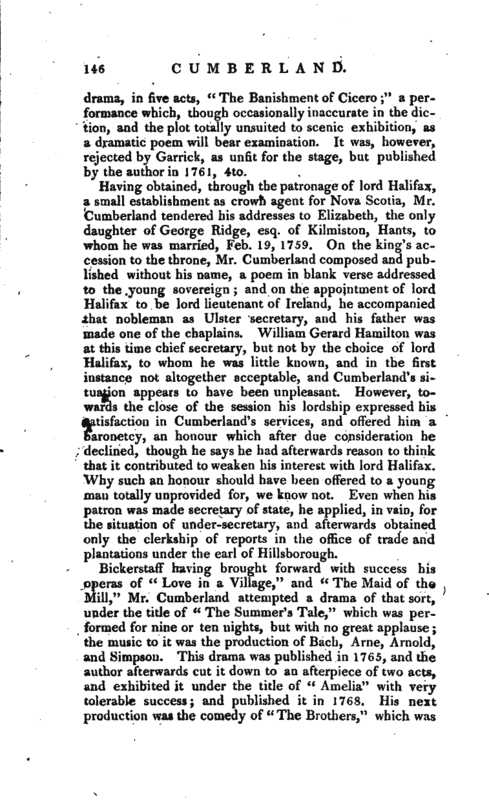 They underwent a severe examination from the electing seniors; and Cumberland particularly from Dr. Smith, the master; and on the next day Cumberland and Mr. Orde (afterwards master in chancery), who was of the same year, were announced as elected, to the exclusion of two of the year above them. After his election, he went home to Stanwick, and from thence made a short visit to lord Halifax. 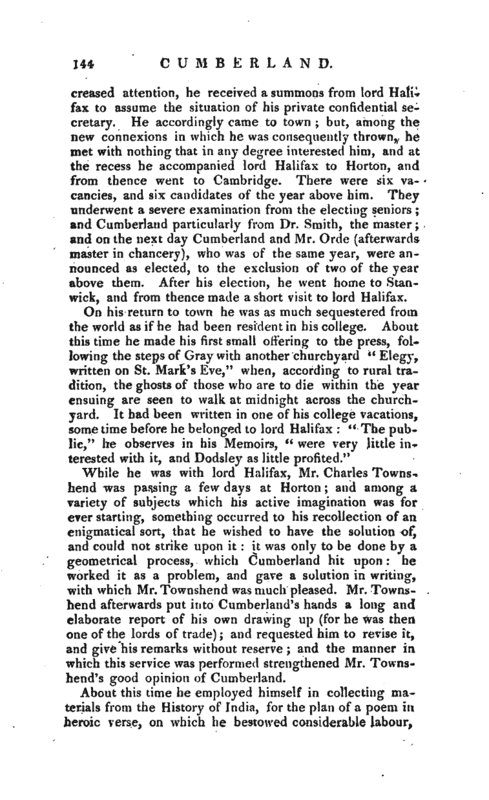 While he was with lord Halifax, Mr. Charles Townshend was passing a few days at Horton; and among a variety of subjects which his active imagination was for ever starting, something occurred to his recollection of an enigmatical sort, that he wished to have the solution of, and could not strike upon it: it was only to be done by a geometrical process, which Cumberland hit upon: he worked it as a problem, and gave a solution in writing, with which Mr. Townshend was much pleased. Mr. Townshend afterwards put into Cumberland’s hands a long and elaborate report of his own drawing up (for he was then one of the lords of trade); and requested him to revise it, and give his remarks without reserve; and the manner in which this service was performed strengthened Mr. Townshend’s good opinion of Cumberland. After the death of lady Halifax, on coming to town for the winter season with his patron, he read and wrote incessantly, and lived in all the temperance, and nearly all the retirement, of a hermit. The residence in town, however, which his attendance upon lord Halifax entailed upon him, and the painful separation from his family, became almost insupportable to him. But, whilst he was meditating a retreat, his father exchanged his living of Stanwick for Fulham, in order to afford him an easier access to his friends. In consequence of his occasional visits there, he became a frequent guest at La Trappe, the house of the eccentric Mr. Dodington, and passed much time with him there, in London also, and occasionally in Dorsetshire. His attendance on lord Halifax did not prevent his continuing this intimacy: indeed it was correspondent with lord Halifax’s wishes that he should cultivate Mr. Dodington’s acquaintance; for his lordship not only lived with him upon intimate terms as a friend, but was now in train to form some opposition connexions, having at this time thrown up his office of first lord of trade and plantations, and detached himself from the duke of Newcastle’s administration. In the summer of this year he went to Eastbury, the seat of Mr. Dodington, where he remained some time, and had ample opportunity of obf>erving the character of his host, of which he has given an interesting description in his “Memoirs,” as well as that of many distinguished visitors there. 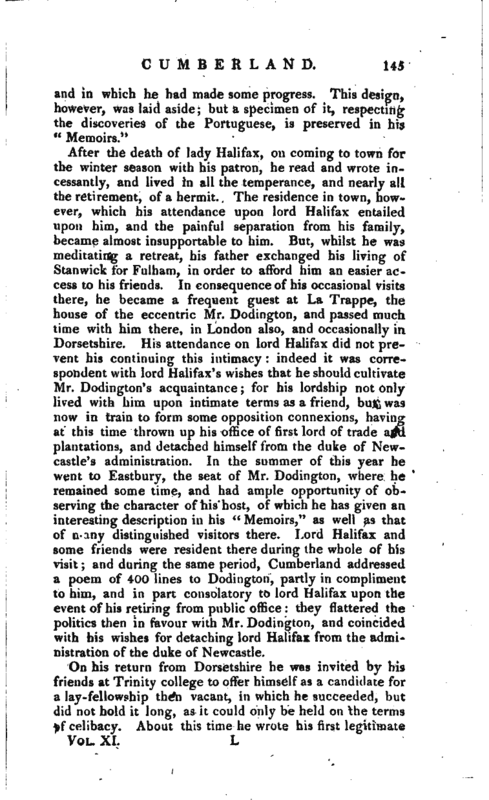 Lord Halifax and some friends were resident there during the whole of his visit; and during the same period, Cumberland addressed a poem of 400 lines to Dodington, partly in compliment to him, and in part consolatory to lord Halifax upon the event of his retiring from public office: they flattered the politics then in favour with Mr. Dodington, and coincided with his wishes for detaching lord Halifax from the administration of the duke of Newcastle. On his return from Dorsetshire he was invited by his friends at Trinity college to offer himself as a candidate for a lay-fellowship then vacant, in which he succeeded, but did not hold it long, as it could only be held on the terms of celibacy. About this time he wrote his first legitimate | drama, in five acts, “The Banishment of Cicero;” a performance which, though occasionally inaccurate in the diction, and the plot totally unsuited to scenic exhihition, as a dramatic poem will bear examination. It was, however, rejected by Garrick, as unfit for the stage, but published by the author in 1761, 4to. Having obtained, through the patronage of lord Halifax, a small establishment as crown agent for Nova Scotia, Mr. Cumberland tendered his addresses to Elizabeth, the only daughter of George Ridge, esq. of Kilmiston, Hants, to whom he was married, Feb. 19, 1759. On the king’s accession to the throne, Mr. Cumberland composed and published without his name, a poem in blank verse addressed to the young sovereign; and on the appointment of lord Halifax to be lord lieutenant of Ireland, he accompanied that nobleman as Ulster secretary, and his father was made one of the chaplains. William Gerard Hamilton was at this time chief secretary, but not by the choice of lord Halifax, to whom he was little known, and in the first instance not altogether acceptable, and Cumberland’s situation appears to have been unpleasant. However, towards the close of the session his lordship expressed his satisfaction in Cumberland’s services, and offered him a baronetcy, an honour which after due consideration he declined, though he says he had afterwards reason to think that it contributed to weaken his interest with lord Halifax. Why such an honour should have been offered to a youngman totally unprovided for, we know not. Even when his patron was made secretary of state, he applied, in vain, for the situation of under-secretary, and afterwards obtained only the clerkship of reports in the office of trade and plantations under the earl of Hillsborough. Bickerstatf having brought forward with success his operas of “Love in a Village,” and “The Maid of the Mill,” Mr. Cumberland attempted a drama of that sort, under the title of “The Summer’s Tale,” which was performed for nine or ten nights, but with no great applause; the music to it was the production of Bach, Arne, Arnold, and Simpson. This drama was published in 1765, and the author afterwards cut it down to an afterpiece of two acts, and exhibited it under the title of “Amelia” with very tolerable success; and published it in 1768. His next production was the comedy of “The Brothers,” which was | brought out at Covent Garden, and well received, and published in 1769. During a visit at his father’s at Clonfert, in a little closet at the back of the palace, with no other prospect than a single turf-stack, he began to plan and compose “The West Indian.” It was his object always in his hours of study, so to place himself, as to have little or nothing to distract his attention. During his stay in Ireland, he received from the university of Dublin the honorary degree of LL.D. 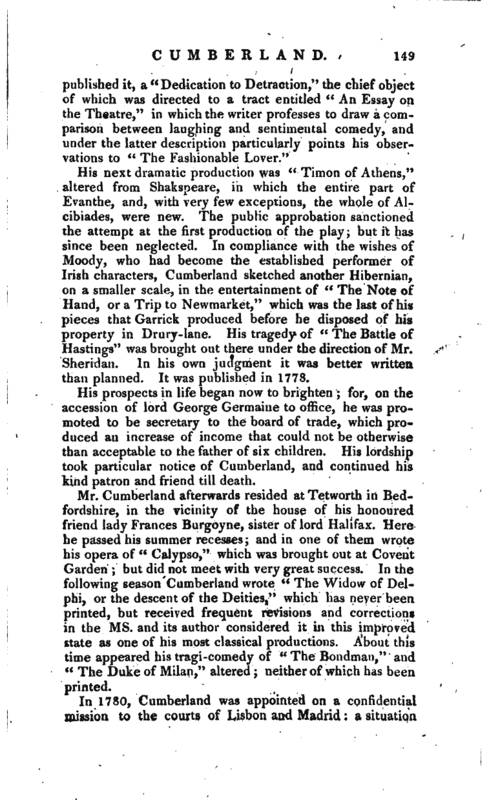 On iiis return to London he entered into an engagement with Garrick to bring out the “West Indian” at his theatre; and availed himself of Garrick’s suggestions in adding a new scene and other improvements. This piece (which appeared in 1771) proved successful beyond the utmost expectation of its author, who was aware that the moral was not quite unexceptionable. Mr. Cumberland now for the first time entered the lists of controversy, in a pamphlet entitled “A Letter to the right rev. 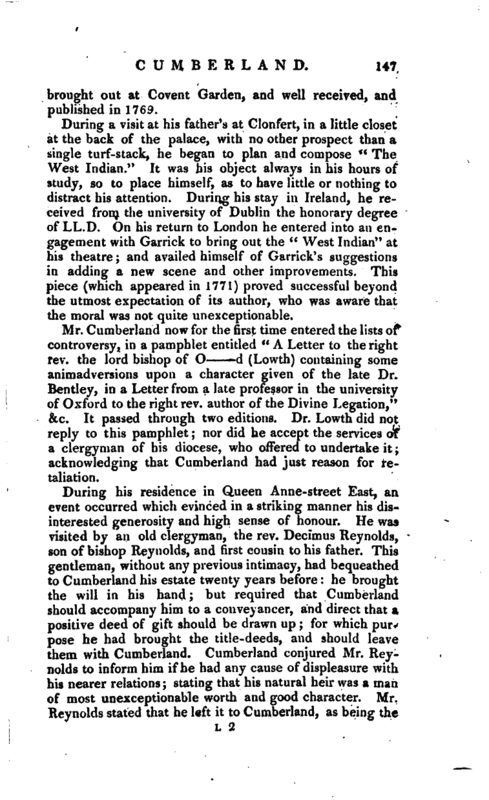 the lord bishop of O d (Lowth) containing some animadversions upon a character given of the late Dr. Bentley, in a Letter from a late professor in the university of Oxford to the right rev. author of the Divine Legation,” &c. It passed through two editions. Dr. Lowth did not reply to this pamphlet nor did he accept the services of a clergyman of his diocese, who offered to undertake it; acknowledging that Cumberland had just reason for retaliation. During his residence in Queen Anne-street East, an event occurred which evinced in a striking manner his disinterested generosity and high sense of honour. He was visited by an old clergyman, the rev. Decimus Reynolds, son of bishop Reynolds, and first cousin to his father. This gentleman, without any previous intimacy, had bequeathed to Cumberland his estate twenty years before: he brought the will in his hand; but required that Cumberland should accompany him to a conveyancer, and direct that a positive deed of gift should be drawn up; for whfch purpose he had brought the title-deeds, and should leave them with Cumberland. Cumberland conjured Mr. Reynolds to inform him if he had any cause of displeasure with his nearer relations; stating that his natural heir was a man of most unexceptionable worth and good character. 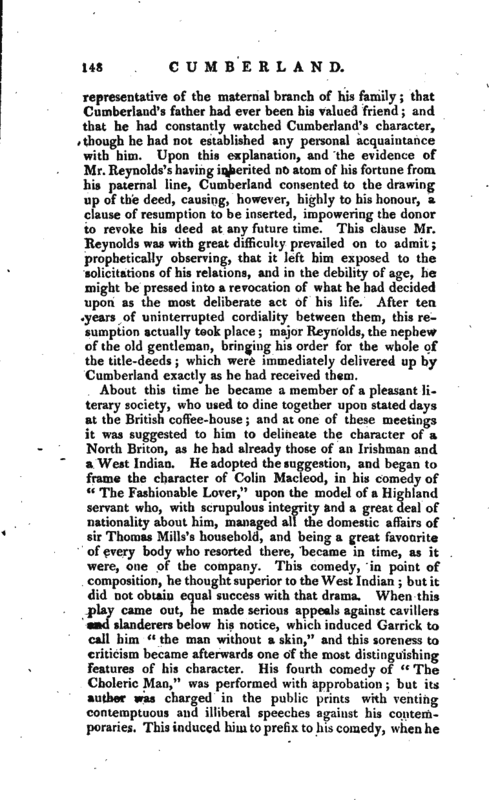 Mr. Reynolds stated that he left it to Cumberland, as being the | representative of the maternal branch of his family; that Cumberland’s father hud ever been his valued friend; and that ho had constantly watched Cumberland’s character, though he had not established any personal acquaintance with him. Upon this explanation, and the evidence of Mr. Reynolds’ s having inherited no atom of his fortune from his paternal line, Cumberland consented to the drawing up of the deed, causing, however, highly to his honour, a clause of resumption to be inserted, impowering the donor to revoke his deed at any future time. This clause Mr. Reynolds was with great difficulty prevailed on to admit; prophetically observing, that it left him exposed to the solicitations of his relations, and in the debility of age, he might be pressed into a revocation of what he had decided upon as the most deliberate act of his life. After ten years of uninterrupted cordiality between them, this resumption actually took place; major Reynolds, the nephew of the old gentleman, bringing his order for the whole of the title-deeds; which were immediately delivered up by Cumberland exactly as he had received them. His next dramatic production was “Timon of Athens,” altered from Shakspeare, in which the entire part of Evanthe, and, with very few exceptions, the whole of Alcibiades, were new. The public approbation sanctioned the attempt at the first production of the play; but it has since been neglected. 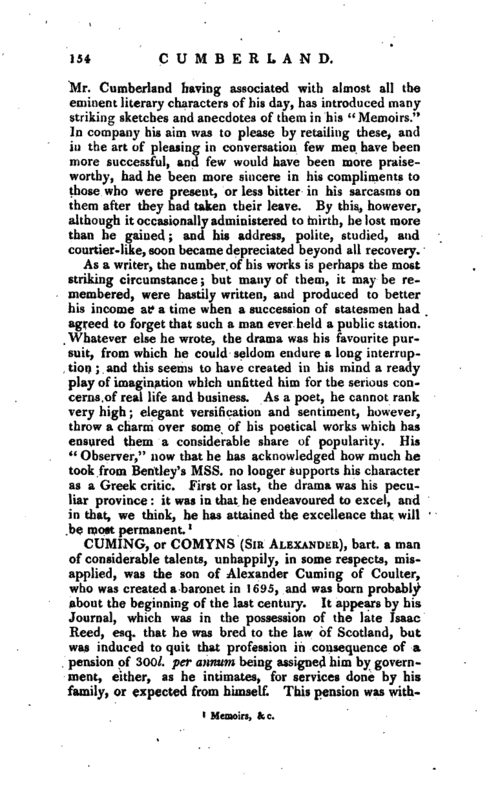 In compliance with the wishes of AJoodv, who had become the established performer of Irish characters, Cumberland sketched another Hibernian, on a smaller scale, in the entertainment of “The Note of Hand, or a Trip to Newmarket,” which was the last of his pieces that Garrick produced before he disposed of his property in Drury-lane. His tragedy of “The Battle of Hastings” was brought out there under the direction of Mr. Sheridan. In his own judgment it was better written than planned. It was published in 1773. His prospects in life began now to brighten; for, on the accession of lord George Germaine to office, he was promoted to be secretary to the board of trade, which produced an increase of income that could not be otherwise than acceptable to the father of six children. His lordship took particular notice of Cumberland, and continued his kind patron and friend till death. Mr. Cumberland afterwards resided at Tetworth in Bedfordshire, in the vicinity of the house of his honoured friend lady Frances Burgoyne, sister of lord Halifax. Here he passed his summer recesses; and in one of them wrote his opera of “Calypso,” which was brought out at Covent Garden; but did not meet with very great success. In the following season Cumberland wrote “The Widow of Delphi, or the descent of the Deities,” which has never been printed, but received frequent revisions and corrections in the ms. and its author considered it in this improved s-tate as one of his most classical productions. About this time appeared his tragi-comedy of “The Bondman,” and “The Duke of Milan,” altered neither of which has been printed. In 1780, Cumberland was appointed on a confidential mission to the courts of Lisbon aud Madrid; a situation | which, however honourable, seems to have laid the foundation of all his future distresses, and to have embittered every remaining hour of a long-protracted existence. The direct object of his embassy was to draw the court of Spain into a separate treaty of peace with this country; and but for the disturbances which took place at that period in London, it is probable that he might have proved successful in his endeavours, since his conduct gave the most perfect satisfaction to the Spanish court, andevtn procured him the particular confidence and attachment of their king. From these events, and other untoward circumstances, he was, in 1781, recalled, after having contracted a debt of near 5OOO/. in the service of his country, not one shilling of which lord North’s ministry ever thought proper to repay him, and to discharge which he was compelled to dispose of the whole of his hereditary property. If it be said that all this rests on Mr. Cumberland’s authority, it may surely be replied that no member of that ministry has attempted ’. deny his account. It has indeed been asserted that he exceeded his commission, but in what respects we are not told, nor whether the losses he sustained were not too heavy a punishment for an error in judgment. He informs us that upon his journey home through France, his bills were stopped, and his credit so completely bankrupt, that he would have been put in prison at Bayonne, had not a friendly fellow-traveller advanced him 500l. which enabled him to pay his way through France and reach his home. 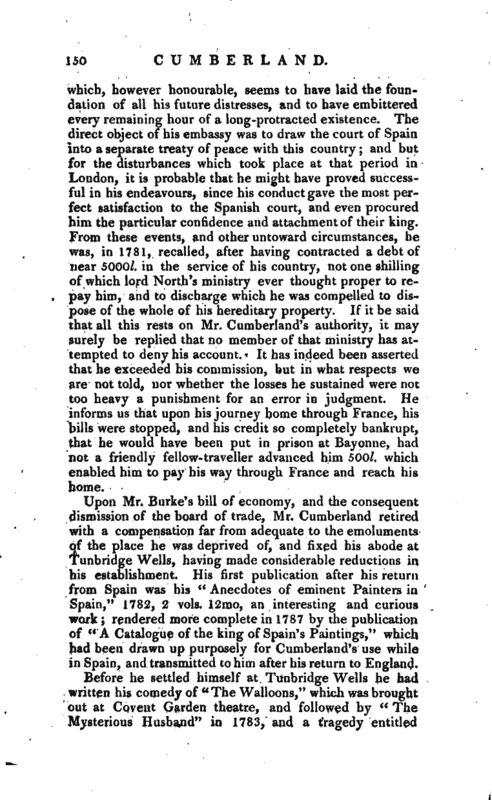 Upon Mr. Burke’s bill of economy, and the consequent dismission of the board of trade, Mr. Cumberland retired with a compensation fur from adequate to the emoluments of the place he was deprived of, and fixed his abode at Tunbridge Wells, having made considerable reductions in his establishment. His first publication after his return from Spain was his “Anecdotes of eminent Painters in Spain,” 1782, 2 vols. 12mo, an interesting and curious work; rendered more complete in 1787 by the publication of “A Catalogue of the king of Spain’s Paintings,” which had been drawn up purposely for Cumberland’s use while in Spain., and transmitted to him after his return to England. 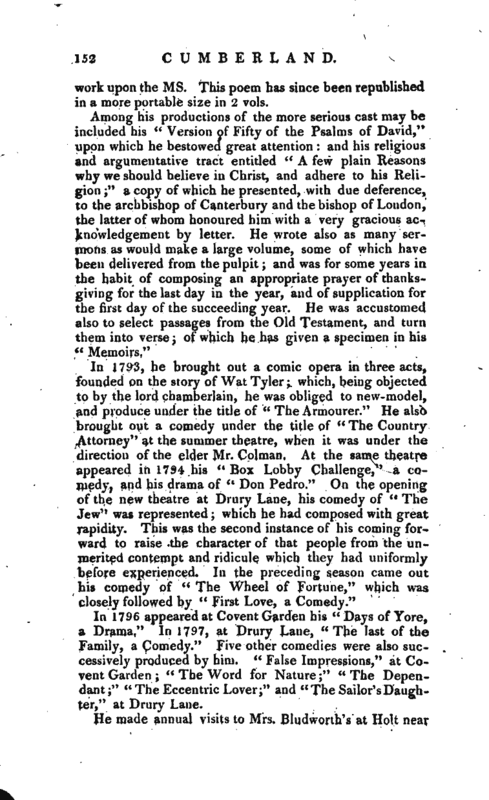 Before he settled himself at Tunbridge Wells he had written his comedy of “The Walloons,” which was brer put at Covent Garden theatre, and followed by “The Mysterious Husband” in 1783, and a tragedy entitled | “The Arab,” but which was acted once only for an actor’s benefit, and has never since been put to any use. In 1783 appeared his “Letter to the bishop of Llandaflf,” respecting his proposal for equalizing the revenues of the hierarchy and dignitaries of the Church Established; and in 1785 his tragedy of “The Carmelite” was brought out; and his comedy of “The Natural Son.” The collection of essays, under the title of “The Observer,” weiv also first printed this year experimentally at Tunbridge Wells, in 2 vols. 12mo. He afterwards engaged with Charles Dilly to publish a new edition, and thereupon stopped the impression of the old. The new edition was considerably augmented, and appeared in five volumes in 1786. When this was out of print he made a fresh arrangement of the essays, and, incorporating his entire translation of “The Clouds of Aristophanes,” edited the work thus modelled in 6 vols. They have since been incorporated in the collection of “The British Essayists.” In 1785 also appeared the “Character” of his kind patron, lord Sackville, which he has farther illustrated in his “Memoirs.” About this time he published, anonymously, a pamphlet entitled “Curtius rescued from the Gulph,” in consequence, as he says, “of Div Parr’s having hit an unoffending gentleman too hard, by launching a huge fragment of Greek at his defenceless head. He made as good a fight as he could, and rummaged his indexes for quotations, which he crammed into his artillery as thick as grape-shot, and in mere sport fired them off against a rock invulnerable as the armour of Achilles.” It is indeed but a very superficial performance. 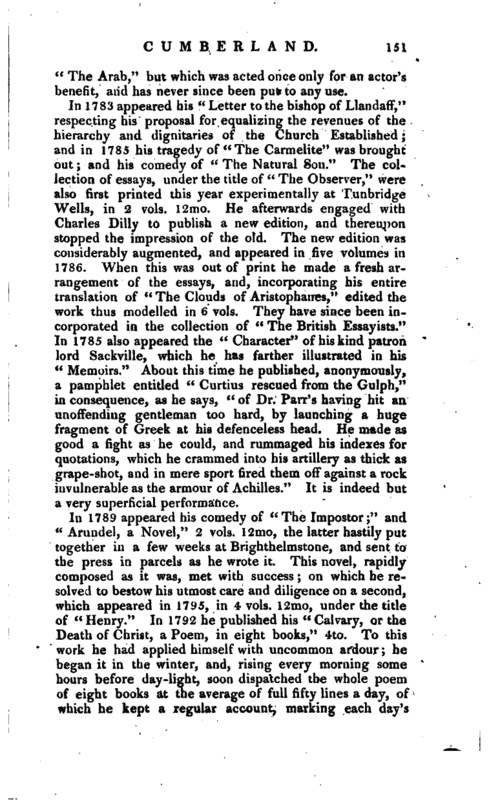 In 1789 appeared his comedy of “The Impostor;” and “Arundel, a Novel,” 2 vols. 12mo, thelatterhastilyput together in a few weeks at Brighthclmstone, and sent to the press in parcels as he wrote it. This novel, rapidly composed as it was, met with success; on which he resolved to bestow his utmost care and diligence on a second, which appeared in 1795, in 4 vols. 12mo, under the title of “Henry.” In 1792 he published his “Calvary, or the Death of Christ, a Poem, in eight books,” 4to. To this work he had applied himself with uncommon ardour; he began it in the winter, and, rising every morning some hours before day-light, soon dispatched the whole poem of eight books at the average of full fifty lines a day, of which he kept a regular account, marking each day’s | work upon the ms. This poem has since been republished in a more portable size in 2 vols. In 1796 appeared at Covent Garden his “Days of Yore, a Drama.” In 1797, at Drury Lane, “The last of the Family, a Comedy.” Five other comedies were also successively produced by him. “False Impressions,” at Covent Garden “The Word for Nature;” “The Dependant;” “The Eccentric Lover;” and “The Sailor’sDaughter,” at Drury Lane. He made annual visits to Mrs. Bludworth’s at Holt near | Winchester; where, being absent from his books, he amused himself with poetical trifles on various subjects, some of which he has preserved in his Memoirs; as well as many other pieces written on other occasions. In 1806 he brought out his “Hint to Husbands, a Comedy,” at Covent Garden, which was performed for five nights only. In the same year he published “Memoirs of his own Life,” 4to, to which he afterwards added a Supplement, of which we have availed ourselves in this sketch. The publications he was afterwards concerned in are, “The Exodiad,” an epic poem, written in conjunction with sir James Bland Burges. “John de Lancaster,” a novel, in 3 vols. and “Joanna of Montfaucon,” a dramatic romance. He was also the conductor of “The London Review,” a new attempt, in which the reviewers gave their names, but it did not succeed. From the time of his secession from public life, Mr. Cumberland resided at Tunbridge Wells, devoting his time solely to his literary occupations. Here he lost his wife, the happy partner of all his joys, his affectionate consoler in every sorrow. This stroke of affliction he bore with the resignation of a man of sense, convinced, as he says, that patience is no mark of insensibility, nor the parade of lamentation any evidence of the sincerity or permanency of grief. During the alarm of invasion he headed two companies of volunteer infantry, and received the commission of major-commandant. So beloved was he by his corps, that they honoured him with a sword as a mark of their esteem; and at the conclusion of the peace, agreed to serve under him without receiving their customary pay. His last days were spent chiefly in London, where he died May 7, 1811, after a few days illness, at the house of his friend, Mr. Henry Fry, Bedford-place. The last act of his life was the publication of a poem called “Retrospection,” a kind of legacy of opinions concerning the “men and things” more fully handled in his Memoirs. In appreciating the personal character of Mr. Cumberland, the reader may be very safely directed to these “Memoirs,” where the disguise of self-esteem is too thin to hide what is attempted to be hidden. It was Mr. Cumberland’s misfortune to be bred a courtier, and never to have attained his degrees in that school. 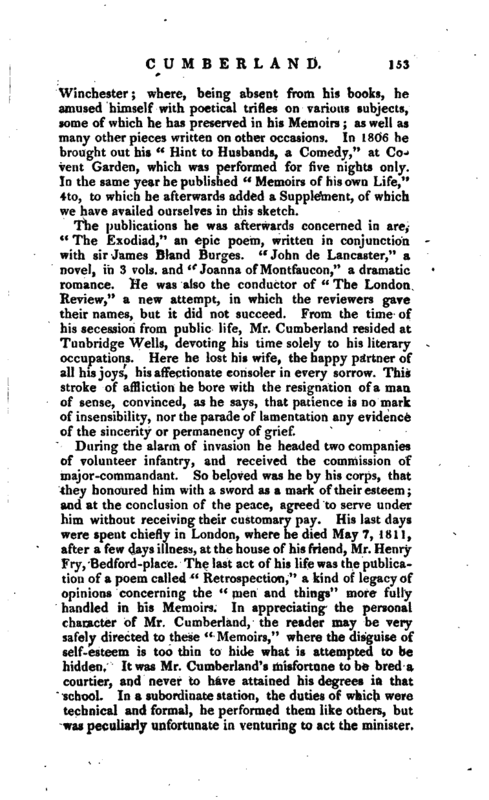 In a subordinate station, the duties of which were technical and formal, he performed them like others, but was peculiarly unfortunate in venturing to act the minister, | Mr. Cumberland having associated with almost all the eminent literary characters of his day, has introduced many striking sketches and anecdotes of them in his “Memoirs.” In company his aim was to please by retailing these, and in the art of pleasing in conversation lew men have In-*, n more successful, and few would have been more praiseworthy, had he been more sincere in his compliments to those who were present, or less bitter in his sarcasms on them after they had taken their leave. By this, however, although it occasionally administered to mirth, he lost more than he gained; and his address, polite, studied, and courtier-like, soon became depreciated beyond all recovery.